The Royal Worcester Stinton story and details for John Stinton jnr, James Stinton and Harry Stinton. 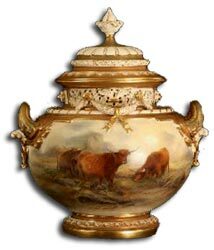 The Worcester Stinton dynasty is renowned for their famous Highland Cattle and Gamebird scenes. They are probably the best known of all Royal Worcester artists, with members of the family painting at the various Worcester factories for almost one hundred and sixty years. The best known of these would undoubtedly be Harry Stinton, his father John Stinton junior and his uncle James Stinton, but they were backed up and inspired by several other members of the Stinton family. The Stinton dynasty started with Henry Stinton who worked at the Grainger factory, which from 1805 became part of the Royal Worcester marque. He was one of the very first top quality ceramic artists to be employed there, but few records survive from the early days of the Grainger factory and it is only from parish records that we know he worked there at all. Ceramic artists seldom signed their pieces in those days, so nothing is known about Henry Stinton’s life or his work. John Stinton snr, was the first major member of the family to appear in the records. He was Henry Stinton’s son and born in 1829. John Stinton snr, started at the Grainger factory in 1840 aged eleven years and stayed there throughout his long working life, until his retirement in 1895. John Senior was a consummate landscape and figure artist and by the age of twenty two had become one of the most senior and respected artists in the Grainger workforce. John was the first of the Stintons to mix oil of cloves with his paints to stop them drying out too quickly. This trick was passed from Stinton to Stinton through the years and many of the Royal Worcester workforce would comment on the smell emanating from their workspace. John Stinton senior had five sons, three of whom became painters at Royal Worcester factories. John Stinton Junior was John seniors eldest son, born in 1854 he did not turn to china painting until he was thirty five, when he joined his father at the Grainger factory. Walter Stinton was born in the late 1860s and was John seniors fourth son. He started at the Grainger factory as a landscape painter where he produced many scenes of New Zealand, copied from other pictures. He later moved to the short lived Locke factory where he became known as a fine painter of gamebirds. He was a skilled painter and may have been the inspiration for his younger brother James’s love of the subject. When Locke’s closed down in 1905, Walter left the industry altogether to work in Droitwich making windmills. James Stinton was John seniors youngest son and one of the best known of the Worcester Stinton painters. Born in 1870 he joined the Grainger factory with his father and brother a short while before they were taken over by the Royal Worcester works in 1902. Following the take over he moved across to the main Worcester factory where he stayed until his retirement in 1951. Of John Stinton seniors three children who worked as china painters only one, John junior, had children that also followed them into the industry. In 1882, Annie Stinton was born and followed her father and uncles into the Grainger factory before moving over to the Royal Worcester works. She was a general paintress but I am not aware of any work actually signed by her. In 1882, Kate Stinton was born and is known to have worked as a paintress at the Royal Worcester factory but nothing else is known. In 1883, Harry Stinton was born. Harry was John juniors youngest son and some might say he is the the best and last. For four generations, and one hundred and fifty eight years the Stintons were represented at the Worcester factories. Their work commands high sums and will doubtless be collected and prized by many generations of Worcester porcelain collectors to come. 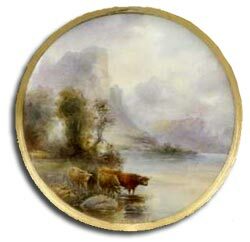 John Stinton Junior is best known for his famous Highland cattle scenes but also produced many paintings of English cattle and was a fine painter of British castles which appear over his signature, on many Worcester cabinet plate centres. There is a well known joke that John Stinton, despite all his skills with Highland cattle, could not paint feet. It is true that his artworks usually show cattle in long grass or heathers with no visible feet; but then has anyone ever taken a lawnmower into the wild Highland heaths. The bulk of Johns work was done after the turn of the century when it was usual for the best artists to sign their work. 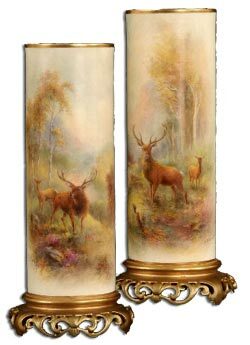 His work in watercolours is also well known and like many of the porcelain painters of the time John produced private artwork to boost his income during the hard times. Usually of similar subjects to his Worcester porcelain paintings. Outside the workplace John was a keen gardener, and a very practical man. He kept a heated greenhouse where he grew and cured the pipe tobacco that he smoked constantly. John stinton Jnr lived to the ripe old age of one hundred and two. James Stinton was the youngest son of John Stinton senior and John juniors youngest brother. James started with the Grainger factory specialising in gamebirds on ornamental vases, plate centres and coffee sets. He moved to the Royal Worcester factory when Graingers was taken over in 1902. 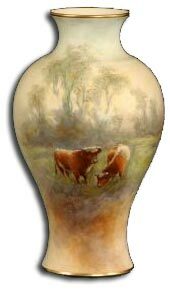 James is well known for his watercolours, mostly of the same subjects he painted on porcelain. He was a fine painter of pheasants, grouse and other game birds, either in flight or on the ground in their natural setting. 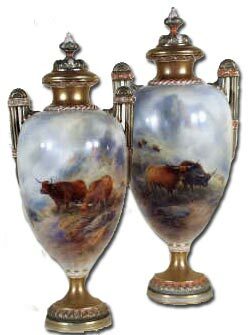 He produced a huge volume of these on everything from large decorative vases to dinner services and tea cups or coffee cans. John is also well known for his game bird watercolours and both are equally desirable and sought after. For many years James would paint a plate from the Royal Worcester factory and send it to his brother in America for Christmas and birthdays. His brothers descendants now have a fine and extensive collection. James Stinton retired from Royal Worcester in 1951 at the age of 81. Harry was the son of John junior and the nephew of James. He was born in 1883 and he suffered from many childhood illnesses that meant frequent hospital visits and long admissions. In 1896, Harry began work at the Worcester factory and studied under his father. 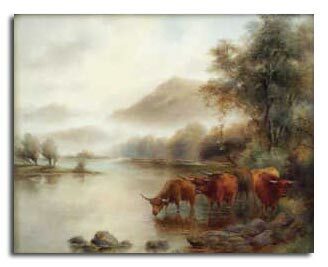 He learned to produce the same highland cattle scenes, although he guided his palette more to the purples and autumnal tints to differentiate them from his fathers work. He appears to have benefited from the experience, as he grew into an imposing figure that many people likened to his father and to the Highland cattle that they both painted. Harry was a keen fisherman and would spend much of his time with Harry Davis though both he and his father were generally regarded as loners. A great exhibitor Harry won several medals from the National Art School and went on to become a greatly respected water-colourist. He won several awards for his pictures; which covered many pastoral scenes of sheep, gamebirds and plain landscapes as well as his highland cattle scenes.